MOSCOW, November 8. /TASS/. An old Soviet-era satellite Kosmos-1441 has lost orbit over the Pacific Ocean on Saturday, a spokesman for the Russian Aerospace Defence Forces told TASS on Saturday. 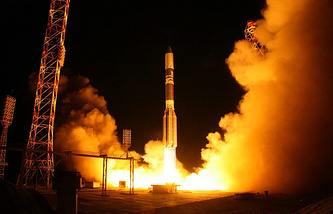 “Fragments of the space object lost orbit at 14.52 Moscow Time,” Aleksey Zolotukhin said adding that the Aerospace Defence Forces had under their control and carried out analyses of the satellite condition and also daily calculated the date and point where the spacecraft fragments would supposedly lose orbit. The Soviet spacecraft Kosmos-1441 was launched atop the Vostok booster from the Plesetsk launching pad on February 16, 1983 and its active operation on the orbit expired back in February 1984.